In the heart of the green Umbria region, the town of Assisi (the birthplace of St. Francis, patron saint of Italy) is the scenario where is located the Nun Assisi Relais & Spa Museum. The Relais is located in a very quiet area but just a short walk to the centre. The Relais is located inside the ancient monastery of St. Catherine and has been renovated to welcome guests and wrap them in a calm and relaxing atmosphere. The beauty of the place is given by the fascinating contrast between the historicity of the structure, with its massive walls and its delicate frescoes, and the choice of a contemporary design, with elegant and essential lines. Intimate space of physical and mental regeneration, the Wellness Centre Nun Spa Museum can be considered a small private museum, whose six majestic pillars of the first century AD surround the whirlpool. The path Nun, with 4 rooms with different temperature and humidity settings (Tepidarium, Caldarium, Sudatorium and Frigidarium) proposes the revival of the ancient Romans worship for the Spa and allows an immediate rejuvenating and cleansing. The beauty of Umbria, from the cities of Assisi and Perugia to the (lesser known but very fascinating) historical and artistic paths, can easily be explored by hotel guests interested in learning more about this beautiful region. Guests traveling by car can, upon reservation, reserve a space in the paid parking. Double rooms furnished with a contemporary style that harmoniously blends with some traditional elements such as the use of terracotta, wood and stone. The rooms have private bathroom with shower and overlook the city or the hills. In this room it is not possible to add more beds. The suites have a double bed and can accommodate a maximum of three adults and one child. The rooms have traditional stone walls and are furnished with designer furniture, fine rugs, comfortable easy chairs, ancient terracotta floors. 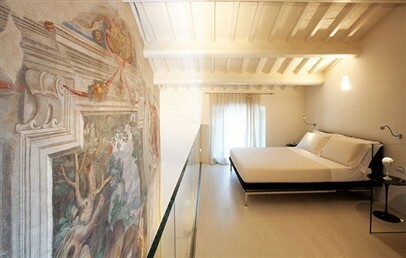 The suites have a bathroom with shower and overlook the city of Assisi or the Umbrian hills. The suites have a double bed and can accommodate a maximum of three adults and one child. They were obtained from rooms containing ancient niches, walls and stairs of ancient stone as well as wood beam ceilings. 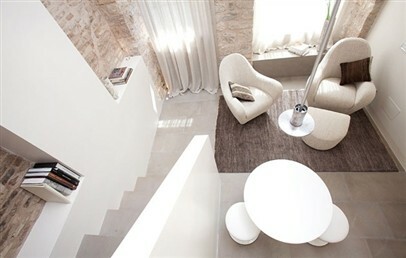 The suites have a bathroom with shower and overlook the city of Assisi or the Umbrian hills. Depending on the suite you will find a mansard ceiling, a private balcony or a large living room located at a different level than the bedroom. 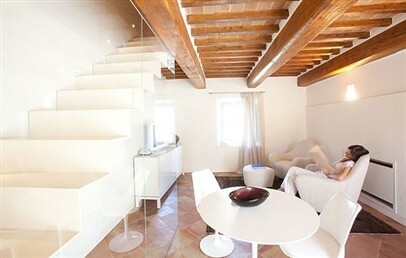 Suites with double room, some with a loft and some with separate living room. They can accommodate a maximum of three adults and one child. The style is contemporary but the reference to the past of the building is quiet strong. The Privilege Suite have a bathroom with shower and overlook the city of Assisi or the Umbrian hills. 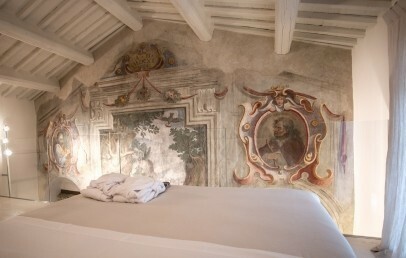 Some Suites have the original stone walls visibly and other boasts a beautiful fresco dating back to 1612.